Nate Beaty has been doing witty, expressive and self-deprecating mini-comics for quite some time. 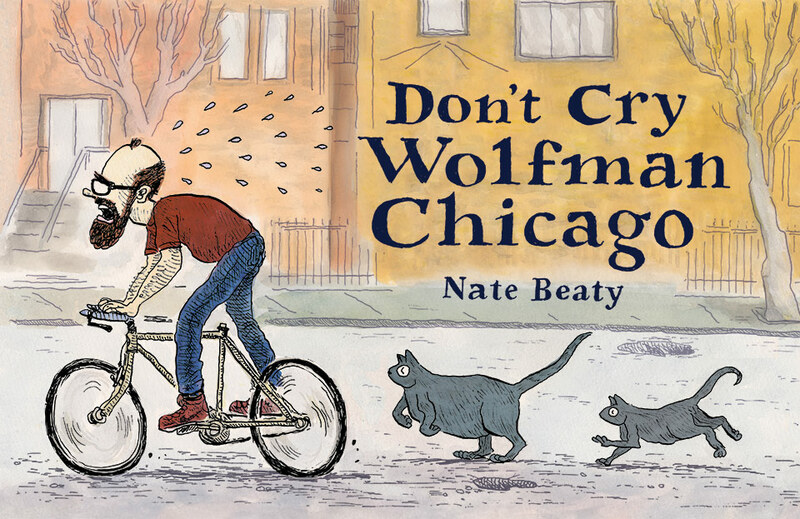 One gets a sense of that experience, both for good and ill, in reading his collection Don't Cry Wolfman Chicago. He's reached an age (late thirties) and a stage in his career, where it's no longer effortless to stay up all night and draw comics. There's also a clear sense of a constant reevaluation of his life and life choices, to the point where he mocks that tendency. The entire book is defined by a sense of push-and-pull, of wanting to make or have made different choices but knowing that he wouldn't be satisfied no matter what. There are, of course, the prerequisite strips about cats, none of which especially stand out. The better strips are those where Beaty has an understanding of his age and how similar he his to other cartoonists in his age cohort, as the hilarious strip "Cartoonist Gaggle" points out: three dudes with beards, flannel shirts and jeans all order whiskey and then perform various attention-getting acts in a sort of parody of a mating ritual. Beaty has a knack for self-deprecating humor that doesn't lapse into mere self-loathing. Part of that is his self-awareness as a cartoonist and person, and part of that is his bedrock need to relate narratives with punchlines. He's always going after the punchline, no matter what. There are also the expected strips about the questionable career path of being a cartoonist, but these are generally pretty funny. My favorite was "Midlife Nofuckingidea", where Beaty asks himself if he should spend a bundle of cash on Transcendental Meditation, go on a road trip with cats, become a boxer or be a full-time cartoonists...and he concludes that the last choice sounds craziest. One thing that helps him sell his gags is his scribbly, often densely-hatched and highly expressive line. His self-caricature, with the beard and/or mustache, receding hairline and glasses is funny in and of itself. His need to create gags gives the book a cheery tone even when it tackles things that are unpleasant, like depression, loneliness and the sense that he's broken in some fundamental way. It's not just his line that's fun to look at, but also the way he uses a frenetic sense of exaggeration to bolster his gags. The final panel below is a good example of this, as his mouth is gaping open and he's shedding tears like a sprinkler. Even better is the strip below that, a frenzied, scribbly mass of lines that nonetheless hilariously anticipate and then deliver the punchline. Keeping a steady four or six panel grid anchors his comics and helps him create the rhythm needed to set up his punchlines. That sense of Beaty being broken is best expressed in his strips about loneliness. It's not that he can't find romantic partners; indeed, they come and go in the nearly three and a half years the book covers. 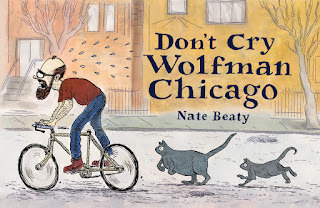 That's actually one of the book's strengths as a work of humor; by not forcing the daily diary formula on the reader, Beaty is able to pick and choose certain experiences for maximum impact. In some strips, he seems content and happy to have a girlfriend. In others, he hints at chafing at being that directly involved in someone else's sphere of existence. It's not so much the individual that's bothering him, but rather the very concept of being non-autonomous and codependent on others in any way. At the same time, he acknowledges that desperate need for human companionship, and there are not pat answers provided inbetween gags. There's only an acknowledgement that he's unable to be present in a given situation and not think about how its opposite might be more appealing to him. He portrays himself as being haunted by that sense of the good being the enemy of the perfect, only there's no way to have a perfect life given the contradictions he's plagued by. That said, the only way out for Beaty is cartooning, as he keeps creating, keeps thinking and keeps laughing:at himself, at the life he's created for himself and at the world around him.